Today I want to introduce my friend Liz. She has been blogging for quite a few years and in April welcomed a super sweet little girl. She is still a newbie to parenting but has far more experience than I. So I asked Liz to share with me some advice for those first few weeks and months with a newborn and adjusting to motherhood. There is so much advice out there that I wanted to be sure to get some advice from someone who was as much like me as possible: we both work exciting and demanding jobs for the same company, live in the same city, are roughly the same age, have great personal style and put a high premium on going out to dinner & drinks! Lots of good stuff in here, my personal favorites are #5, #8 & #9- a cookie!!! Hi Making La Madre readers! I’m Liz, a relatively new mama to my 8-month-old daughter, Elodie. 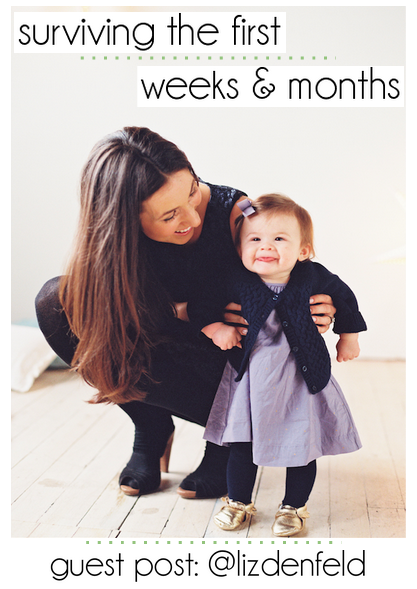 Lydia asked me to share some thoughts and tips on surviving those first weeks and months with your little one. I’m so glad she did! It’s been so fun reading along as Lydia explores this new life that awaits her. She’s in the home stretch now! I remember feeling exactly like she does now – moments of total excitement mixed with sheer panic. Completely normal. Most people fear the unknown – I know I did! But I’ve made it through eight months of motherhood and I’m happy to report that it’s pretty.freakin.awesome. Here are a few tips and tricks for surviving those first months home with your babe. It’s true what they say – you won’t be sleeping much those first few weeks. My advice is to forget the concept of “morning” and “night”. Just think of time as continuous, and then you won’t be as depressed when you’re going to bed (aka taking a 3 hour nap) at 7PM and up nursing at 3AM (instead of getting home from the bars…). This too shall pass. Shower and “get ready” every day (okay, most days). This will make you feel human and a whole lot happier. Speaking of food. Don’t let anyone in your house without bringing a meal with them. Seriously. Before baby is born, go out to Trader Joe’s or New Seasons and stock up on your favorite snacks. Anything you can eat with one hand that isn’t just total junk. You’ll be so glad to have these healthy snacks around once dad goes back to work and you’re doing everything one-handed. Okay, this tip is going to sound a bit extravagant, but for me it was vital to my survival. Invest in a good coffee machine. For us, it was the Nespresso Vertuoline. Being able to whip myself up a latte whenever I wanted was not only necessary, but felt indulgent, too. I looked forward to it every morning (noon, and night…). Let your partner help. This wasn’t a big issue for me, but maybe it’s because I heard this piece of advice several times before Elodie was born. Let them change diapers, burp the baby, rock them to sleep, bathe them… The list goes on. It’s tough for some moms to let go and let their significant others do it their way, but your sanity depends on it. You can’t (and shouldn’t) do it all! Be kind to yourself. Of course I knew I wouldn’t be back in my pre-pregnancy jeans a week after E was born, but I will say that it was a lot harder for me to accept my post-partum body than I thought it would be. Things are squishy for a while, and it takes a bit for everything to move back into its place. Your clothes will fit different and that can make you feel weird (and maybe a little desperate). Just be patient and forgiving with yourself. It doesn’t happen overnight, but things will go back to normal! You really don’t realize just how fast an hour or two goes by until you have a newborn baby and they’re eating that often. You can easily come to the end of a day and feel like you’ve done nothing but feed your baby! That’s not necessarily a bad thing, but for me it was really important to find time at least once a day to do something for myself – take a bath, sit in a quiet room alone and read a few pages of a book or magazine, shop online, eat a cookie, whatever. Forget all the “rules” — the first three months (also known as the 4th Trimester) are all about survival mode. Hold your baby for every nap if you need (or want!) to, nurse him or her to sleep, give them a pacifier day one (or day two, like us). As a first time parent you are bombarded with advice and rules and you’re constantly questioning if you’re doing everything “right”. I’m here to tell you there is no right way to parent. Every baby is different, every situation is different. Trust your instincts (they will be there – you will hear them loud and clear) and don’t worry about anyone or anything else. Most of all, just try to enjoy the tough but magical first weeks with your little one. I thought people were totally nuts when they looked at my two-week-old and said they missed the sleepless nights and newborn cries. Now I get it. It really is such a short period of time that passes quickly. Before you know it your little one will be eight months old, crawling all over the place, laughing and smiling! Life will be different, but it will be so very sweet. Thanks so much Liz! Looking forward to more guest posts in the future from other friends and readers. Previous Post are you following me? It goes by so fast! Just try to savor the times. And you can never take too many pictures and videos! When I look back at my kids, it’s the little things that I remember.